HomeStoriesWords of WisdomComfort Me with Food! Just about any magazine you pick up these days is likely to mention “comfort foods”–those foods that give you a feeling of well-being and link you to a person, place, or time that stands out in your mind as a good memory. We usually tend to think of comfort foods as something homemade and warm, like soup. 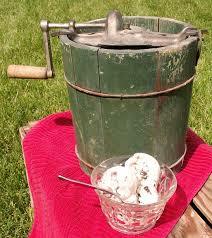 But as July 4th approaches, I am always reminded of a different kind of comfort food: homemade ice cream. My mom would mix the ingredients and pour into the canister; Dad would add the ice and salt and begin to turn the handle (this was before the days of electric ice cream makers!!). Then my brother and I each got to turn the handle for several minutes before the ice cream began to harden. Once the handle became too difficult for us to turn, my dad took over again….and that’s when my brother and I got to be special helpers. As the handle became increasingly difficult to turn, it became necessary to add weight to the top of the freezer to keep it from moving all over the floor. My brother and I were the weights! My mom would place several clean, folded towels on top of the freezer, and one of us would sit on the towels to keep the freezer steady. I think it goes without saying that we couldn’t sit there very long before certain parts of our bodies began to feel numb from the cold! That was when the sitter would hop off the towels, and the other one hop on. When the handle simply would not turn anymore, then more ice was added, and the freezer was packed with more towels and allowed to sit until dessert time arrived—a wait that seemed to last FOREVER! Making homemade ice cream these days is a lot different than when I was a child. I will always have fond memories of July 4th and summer: hot days cooled briefly by the best tasting homemade vanilla ice cream on the planet. Unfortunately, I haven’t made homemade ice cream in many years—but when my church has its annual “Homemade Ice Cream Fellowship” every July, I am usually the first person in the serving line, and I leave the building as one happy “comforted” creature!! At various times in our lives, we all seek comfort, in one form or another—in food, recreation, or solitude. But our greatest comfort can only be found in God and His Holy Word.